First Team Ruffneck Flight in ground basketball systems 4.5" O.D. Gooseneck Bent Post, 39"x54" Fan Shaped Fiberglass Backboard, Unbreakable Fixed Goal, Lifetime Warranty! 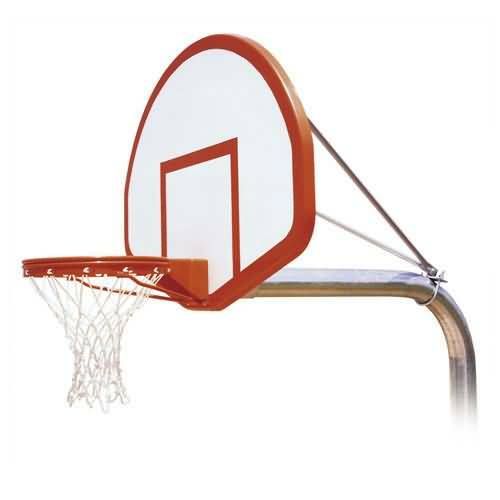 The RuffNeck Fixed Height Basketball Goal offers exceptional durability at a price that meets any budget. First Team offers a wide variety of basketball backboard & rim styles on the RuffNeck system, allowing you to select the perfect RuffNeck package for your application. Every RuffNeck Fixed Height Basketball Goal package comes with a Lifetime Limited Warranty. Approx. Shipping Weight: 240 lbs.